A pulley is a wheel on an axle or shaft that is designed to support movement and change of direction of a taut cable or belt along its circumference. 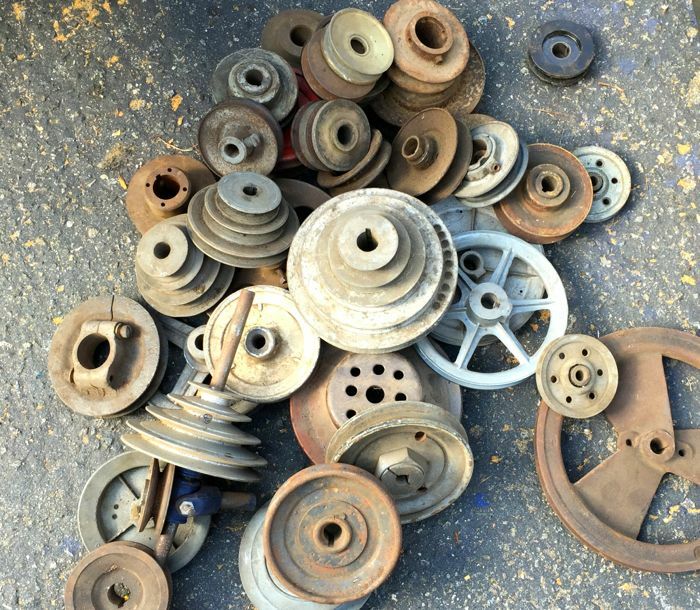 Pulleys are used in a variety of ways to lift loads, apply forces, and to transmit power. This is a small fraction of the haul we brought home from the AGSEM auction. I'm not sure which impresses me more: how little we spent, or how much we got! And the more activities, classes, and wandering around we do at AGSEM, the more I appreciate the opportunities there. They offer a world of learning, of shared knowledge and enthusiasm for makers, tinkerers, enthusiasts of history and craftsmanship. And like AGSEM, I think Wikipedia is a treasure. Not a day goes by that we don't learn something new, or at least find a jumping-off point for acquiring knowledge, with Wikipedia. That pulley definition is a small fraction of what's available to learn from Wikipedia... I think that is really cool! So... yeah, just some deep thoughts and other musings I've been enjoying about the wealth of knowledge and opportunities we enjoy, coupled with the company and mentorship of great friends, and new friends, we have all the makings of happy, interesting lives: BOoM!